Dhaka, 22 April, Abnews: The casualty toll from a suicide blast at a voter registration centre in the Afghan capital Kabul on Sunday rose to at least 31 killed and 54 wounded, a health ministry spokesman said. There has been no claim of responsibility for the blast but the Taliban have denied involvement. There was no immediate claim of responsibility for the attack on a project of key importance to the credibility of President Ashraf Ghani's Western-backed government, which has pledged to hold parliamentary elections this year. However, the Taliban's main spokesman issued a statement on Twitter denying involvement. Interior Ministry spokesman Najib Danesh said a bomber on foot approached the centre where officials had been issuing identity cards as part of a process of registering voters for the election scheduled for October. A spokesman for the ministry of public health said at least 12 people were confirmed dead and 57 wounded. The explosion destroyed cars and shattered windows in nearby buildings, leaving rubble strewn across the street. ‘There were women, children. Everyone had come to get their identity cards,’ said Bashir Ahmad who had been nearby when the attack took place, after weeks of relative calm in the capital. 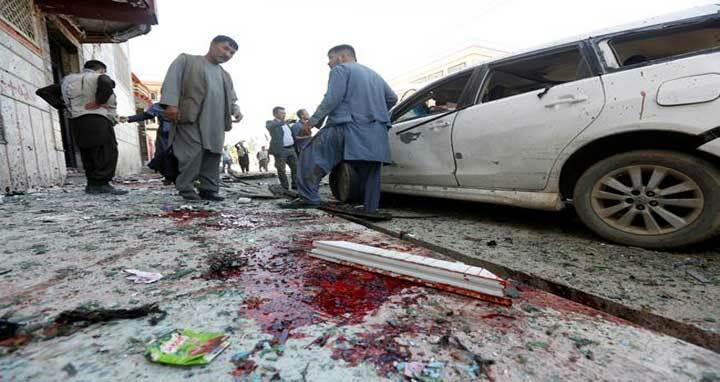 The blast took place in Dasht-e Barchi, an area of western Kabul inhabited by many members of the mainly Shi'ite Hazara minority, which has been repeatedly hit by attacks claimed by Islamic State. Voter registration centres have been set up across Afghanistan ahead of long-delayed parliamentary and district council elections due to be held in October and there have been serious concerns that militants might attack them.